Description: Though it's not on many people's favorites list, the #2525 Playground was one of the better-designed Little People toys to come out of the dire late 1980's period. 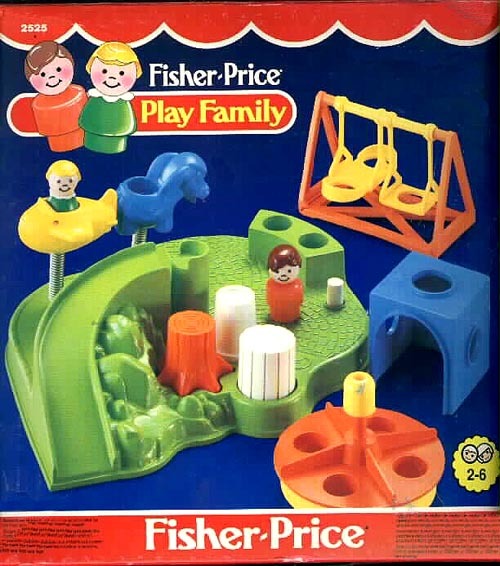 The base itself was constructed of hard rather than soft plastic, as many of the cheaper 1980's sets were, and the swing and merry-go-round were the same as used in #923 School. The playground also gave birth to an exclusive piece all it's own--a square, blue climbing cube which, no surprise, is the hardest of the pieces to find. Designed for children ages 2 to 6 years old. B2525A - Green base playground with attached play equipment: an orange tree stump, white tree stump, a green sliding board, and 2 spring-supported 1-seat rides: a blue airplane, and a yellow rocking horse. Overall size: 9-1/2" wide, 8-1/4" deep, and 4-1/8" tall. *See "Variations" below. FPT12 - Square blue climbing cube with holes on the top and 3 sides, and an arched opening on one side. B2525B - Green base playground with attached play equipment: an orange tree stump, white tree stump, a green sliding board, and 2 spring-supported 1-seat rides: a yellow airplane, and a blue rocking horse. Overall size: 9-1/2" wide, 8-1/4" deep, and 4-1/8" tall. FPT11 - Merry-go-round with a Yellow base and top spin knob, and an Orange 4-seat spinning top. FPT9 - Merry-go-round with an Orange base and top spin knob, and a Yellow 4-seat spinning top. FPT8604 - Yellow swing set with 2 orange swinging seats (1 single and 1 double seat) with a green base. GEPP - The set has also been seen with a light red girl with a dark brown sculpted bob. 1987-1990 - This set was sold in a 9" long, 9-9/16" high, 4-1/2" deep box.